The powerful choice for limited access cuts. Versatile enough for general construction applications, but well suited for limited access cuts, the TS 440 represents the latest in professional cutting solutions from STIHL. The extended guard adjustment range of the TS 440 allows greater access in challenging cuts such as the bottom portions of walls, cutting in corners and cutting the underside of in-ground pipes. This expanded guard adjustability is made possible due to the sensor-activated STIHL Quickstop® wheel brake technology. The first cut-off machine in the world equipped with the technology capable of stopping the rotation of the cutting wheel in fractions of a second if kickback occurs. INTERGRATED WATER HOSE: Helps prevent hose damage. 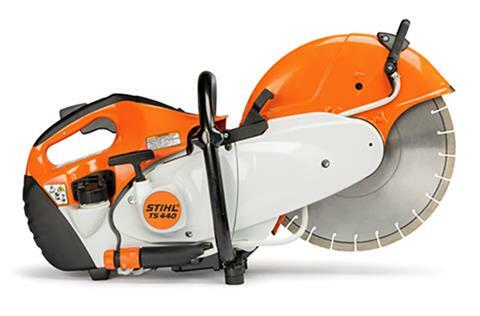 STIHL QUICKSTOP® Wheel Brake: Allows extended guard adjustability by reducing the risk of injury from kickback when the guard has been adjusted to expose the top portion of the wheel. WHEEL GUARD: Expanded wheel guard adjustability range increases utility of machine for certain cutting circumstance. CHOKE LEVER AND PURGE PUMP PRIMER: Conveniently located together for easier starting.